There is one and only one production code that can be executed either on the mainframe or .NET depending on business needs. Raincode provides all of the tools to secure, monitor, and control a phased migration of business-critical applications. DB2 or IMS databases can coexist or be moved safely and securely to MS SQL server if appropriate. Would you bet your company’s future on COBOL developers? Writing new applications and maintain existing legacy can be done in C# instead of COBOL, Assembler, or PL/1. Raincode’s Visual Studio plugin extends the C# experience to COBOL, PL/I, and Assembler, allowing for a consistent experience across legacy languages and the modern world, bridging the gap and ensuring that your staff does not work in silos. 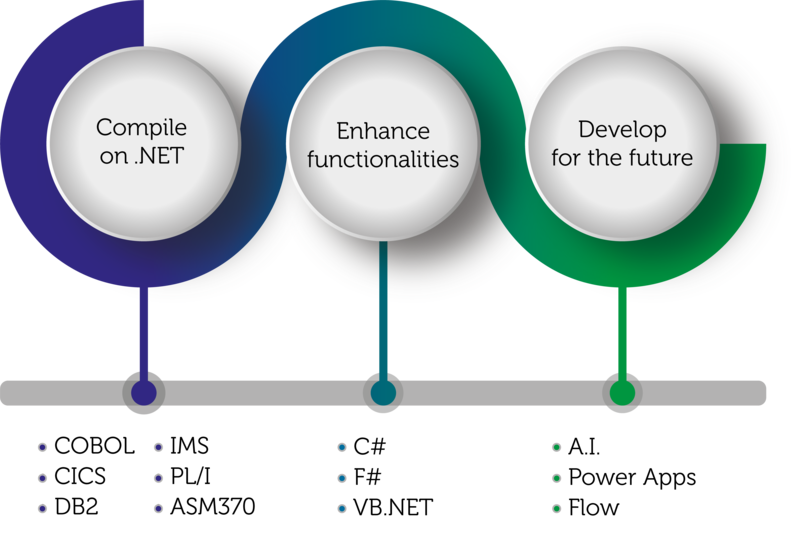 Use the Service Fabric middleware platform to package and deploy legacy-linked microservices for cloud-scale applications or leverage existing applications by executing them on open source platforms with .NET core. In .NET and Azure, you can make use of out of the box tools like PowerBi, PowerApps, Graph, and Flow to enrich your data mining and algorithmic intelligence without the need for costly infrastructure. On the Azure cloud, your mainframe legacy system becomes an instance that you can clone, opening unexpected possibilities for the future. Want to know more about how to transform your mainframe?